Further to my post on Monday where I placed myself well out of my comfort zone by wearing top to toe beige, I decided to run with the theme of less colour but more detail today. My default setting as you know is to turn the volume up colour-wise at every given opportunity, but the positive response to the March Madness feature gave me cause to consider the value of more neutral tones. Less colour doesn't necessarily mean less fun though! What is fun, is the fact that even though I'm in my 60's I am still learning about clothes. If Hilda hadn't come up with that particular challenge I would never have pulled those random separates together to make my homage to beige. The starting point for today's ensemble is this snakeskin jacket which has been gifted to me by JD Williams. The fabric is a suede effect making for a very soft finish, comfortable to wear and more lightweight than if it were real suede. I'm a big fan of biker jackets, so when the offer came to through to choose something from their current range, I was happy to see this one. I don't have a patterned biker jacket in my ever expanding collection so this seemed to be the ideal opportunity. Made to the usual specifications the jacket has zipped pockets and zips on the sleeves plus the slanted zip across the body. The fit is good - I'm a size 10 and this was as expected. My favourite points have to be the pattern (snakeskin is always on trend in my books) plus the cool look of a biker jacket crosses all age groups. I decided to pair the biker jacket up with black work trousers to give a less rock chick look, but as usual I couldn't settle for plain old black trousers could I? These eyelet trim trousers were from Zara last year. They tick the right boxes for me when I need a well fitting ankle length black trouser that keeps me out of the boring zone. The sock boots were from Zara too. I suppose if you don't feel this adventurous you could indeed wear plain black trousers with simple boots or even a pair of sandals with this look - see some ideas for sandals on the JD Williams website here. In my quest to wear less colour I've gone big on accessories, bringing out a new handbag which I bought in a tiny boutique in St Andrews in January. The turtle shape plus all of these sparkling gemstones had that quirky appeal for me and was also in the sale coming in under £40 which suited me too. I've been saving the bag for a special outfit and this seems to be the perfect one. Tonally the jacket and bag work so well together and the black ties in with the trousers too. I really like this mixture of black trousers saying work and biker jacket saying rock chick - it's all about being an individual, isn't it? This may not be a conventional work outfit for some, but it would be great for a lunch out or after work drinks with the girls, don't you think? The final touches for today's look are this statement necklace from Topshop along with these gold coloured rings, both of them pre-loved. Leave me have your votes please for which look you prefer. Either way, I'm a winner! Hi there and welcome to this month's Style Not Age challenge, titled March Madness. I hope that you've been following the lovely group of ladies so that you may understand what madness means to each of us. 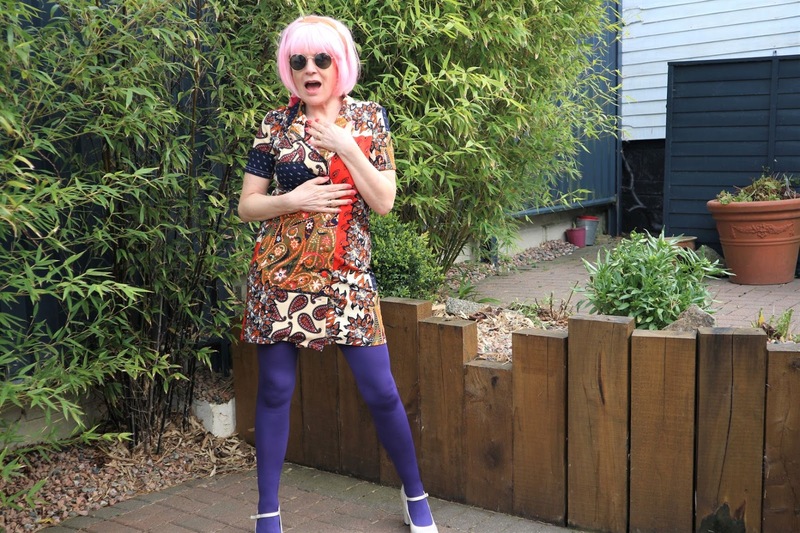 Jacqui of Mummabstylish is quite conservative in her fashion tastes and therefore this mish mash of colours and patterns is indeed madness for her. Style Splash editor Emma has gone all out in her approach to outfit madness from those crazy shoes to the cute fluffy clutch and everything in between. Personally it's something you'd see me wearing any day of the week! Hilda's offering came from a murder mystery dinner she attended recently. The choice of this month's challenge was hers and maybe that's because she had this natty little number tucked up her sleeve. Do whizz across to her blog, Over The Hilda to read more about it. Did I get the memo? Well yes, of course I did. Let me explain. The motto for my blog is "Let's bin the beige and have fun with colour" and therefore it's a form of madness for me to be seen dressed head to toe in beige. Beige = boring in my book. For some, such as my elegant friend Laurie of Vanity and Me Style, well beige is the height of sophistication. She looks classy in beige, I on the other hand, feel dull when I don beige. I know I look completely out of step with the other ladies, all jazzed up in their mad ensembles, but honestly, I couldn't find anything in my wardrobe, be it a bright pattern clash to some mad mix of colours that didn't constitute an everyday outfit for me. I do hope the collective don't feel I've let them down with this challenge. Let's get down to details shall we? The boots are by Michael Kors, handbag is by Radley, trousers are hand-me-downs from my daughter, the brand is River Island, the sweater is pre-loved and is by Carolyn Taylor. As for my accessories, I found the beautiful leather Radley bag in a charity shop last year and the fact that it was in pristine condition helped me get over the colour. I bought the patterned ring at an airport concession in January, the other one is a charity shop find. And I was gifted the Nordgreen watch a few months ago. I dug out my old favourite chunky pearls for the shoot too - these were from Debenhams many moons ago. And the mirror sunglasses are by Quay Australia. I feel I would be letting down my style credentials if I failed to mention the fact that yes, beige is actually the height of fashion currently. Beige Is Back was the headline in January with People magazine amongst others and in the world of interiors beige is the new grey. What can say? Following the latest trend isn't high on my list of priorities, but if something I love happens to be on trend then that's a bonus for me. Those who slavish follow the tidal wave of trends from one season to another will be easy to spot out and about being seen in all the right places as they sport the various shades of creams, tan, flax and cream. Hurrah for me then, that I've hit the mark this month, but it's all very tongue in cheek and you won't be seeing me in this washed out shade again soon. I do hope you'll take a moment to visit the other ladies from the challenge to read their back stories too. Thanks for dropping by and I'll see you again soon! Increasingly I seem to be drawn to the fashions of the 60's. I'm beginning to wonder if this is because that was the decade I was cutting my fashion teeth on as a girl. Do you have a penchant for the trends of your youth? Perhaps you do, but maybe you put up a bit more of a struggle than I do! Today's look is strong and funky which is good enough for me. You may have seen the boots from my previous post when I'd hit the sales in Truro big time. The boots were a consolation prize for me. 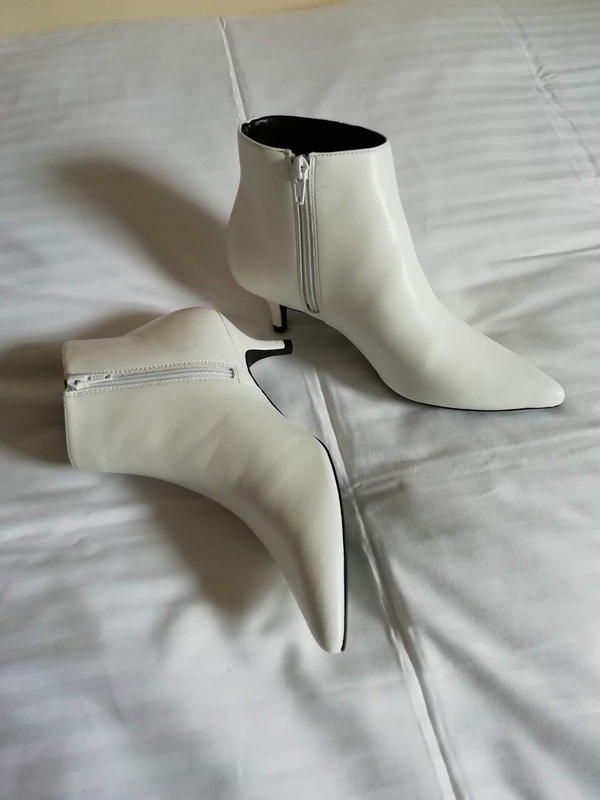 I'd missed buying a pair of white leather boots in the January sale at Topshop and have been hankering after something similar for weeks. I'm breaking fashion ground here as personally I really don't like white boots. 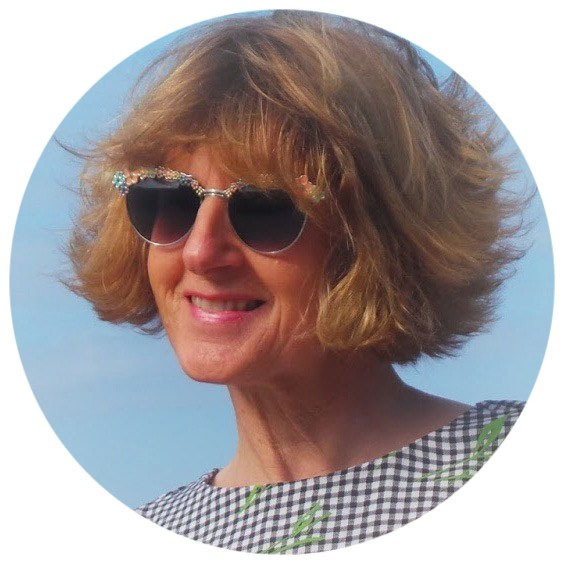 I think they (and all white shoes) were classed at tarty by my mother when I was a young girl and that prejudice had remained with me for many, many years until just recently when I bought some white summer sandals. Maybe they opened the floodgates and are responsible for these kitten heeled boots from New Look. I would have preferred them to be leather, but I suppose you can't expect that for £7, can you? So, last weekend I also did a tad of charity shopping and this skirt was one of my favourite finds. There's a new charity shop opened in Truro for the Cornwall Air Ambulance - a lifeline for the islands too, so I decided to pay it a visit. The shop is well laid out and seems to have quite a lot of new clothes with labels still attached. This skirt and a blue and black version were both brand new from Marks and Spencer. I paid £10 for it and don't begrudge that amount for this local cause. We never know if ones nearest and dearest may need the services of the Air Ambulance one day. The skirt is a lovely fit, hip skimming and tummy smoothing, but best of all is the flap at the front, fully lined and sewn down to spare ones blushes. I also like the two pattern effect of the hounds tooth print. Sometimes M&S manage to surprise me with their designs. I would never have guessed the brand by just looking at it. My black and white sunglasses by Quay Australia came into their own with this outfit - always a nice feeling when these things happen. The necklace was a purchase from a Truro shop last year, but not a charity one (I forget the name, sorry) and the rings are both old, real silver and from different shops, but again not charity ones. The polo neck sweater was however, a pre-loved purchase, new with labels on and chosen for these gilt buttons at the cuffs - adding a touch of class I think. Our weather had improved this morning compared to the gales of late. Polly and I are having to be a bit more creative as to where to take our morning photos and if you look behind me you'll see why. Yes, the entire frontage of the gallery is decked out in scaffolding in preparation for the builders to descend on us soon. The gallery roof has been leaking for some time now and at last we are having some work done. It does mean that Polly and I will be scouting around the area nearby to capture the outfit of the day. As Monday is the last one of the month, that heralds our Style Not Age challenge, so please do come back to see what we're all showcasing for you. I've found this one to be a bit of a difficult one, due to the lack of specifics - sometimes the abstract can just flummox me! Anyway, I've plumped for something bright, that's all I'm saying.